A Follow Spot: Happy August to Me! See the chimpanzee and the birthday cake up there? I used that art last year to accompany my "What's happening in August" blog, since August is my birth month and I've always liked monkeys. And that post got a ton of hits. It's still getting hits. For those of you actually interested in finding out what's happening this month, feel free to ignore the monkey and read on. August is traditionally a slow month in local theaters, as summer seasons wind down and everybody clears the decks for fall. But there are certainly options if you're in a theater-going mood. First up, the Illinois Shakespeare Festival has one more week and six performances to go. There are two opportunities left to see their luminous "Romeo and Juliet," romping "Complete Works of Shakespeare (Abridged)" and emotional "Winter's Tale." I especially liked Deb Alley's production of "The Winter's Tale," set in the Empire period, and I recommend you catch it while you can. "The 39 Steps" also continues through this weekend at Urbana's Station Theater. This funny, silly farce, using four actors to portray way more than 39 characters, is well worth a visit. Performing outside at Miller Park, the BCPA Spotlight Theatre Camp has one weekend left of "Schoolhouse Rock," where you'll learn about conjunctions and verbs and How a Bill Becomes a Law, all in the zippiest way possible. When it comes to new shows in August, Prairie Fire and their "HMS Pinafore" should be first on your list. It opens August 5th and runs through the 14th, with performances at Normal Community High School Auditorium, 3900 East Raab Road, Normal. Kevin Paul Wickart, one of the stars of the show, will tell you more about this "Pinafore" tomorrow, so tune in for that one right here at A Follow Spot. New Route Theatre continues its "One Shot Deal Series" with "Send in the Light," their flagship production, conceived and written by Don Shandrow with songs by Phil Shaw and incidental music by David Berchtold. Shandrow describes the show as, "a celebration of the change electricity brought to rural America in the 1930's" and invites you to join New Route Theatre at the Eaton Gallery on August 10th at 7 pm to experience that light. Over in Champaign, the Champaign-Urbana Theatre Company will present "The Music Man" August 4-14 on the Parkland College Stage. If you are already itching to get your fall plans in shape, you can buy your tickets to Community Players' "And Then There Were None," get season tickets to Heartland Theatre, peruse the fall schedules for ISU and IWU, and check out the Normal Theater's brand-new website. 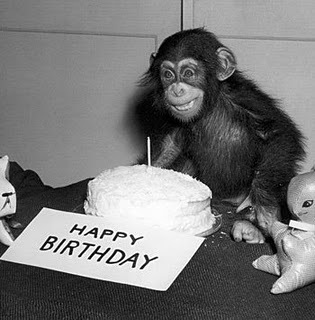 As for me, I will be celebrating my birthday and my anniversary and trying to find a nice chimp to blow out the candles. Let's go to the zoo! Happy Birthday Month!